For students, August means packing bags, enrolling in classes and signing leases. But back-to-school season isn’t just about students. More importantly, it’s about alumni, especially those of us who care about our alma maters’ spots in the U.S. News and World Report, Princeton Review and AP brackets. For the rest of us, August is rankings season. Last year, we put together a list of the top universities producing VC-backed entrepreneurs. It turned out to be a huge hit. This year, we decided to dig deeper into our VC database, which includes educational backgrounds for over 13,000 founders worldwide. The new and expanded list, broken down in our new August/September edition of the VC Monthly, ranks the top 50 universities that produced VC-backed founders on a global basis. 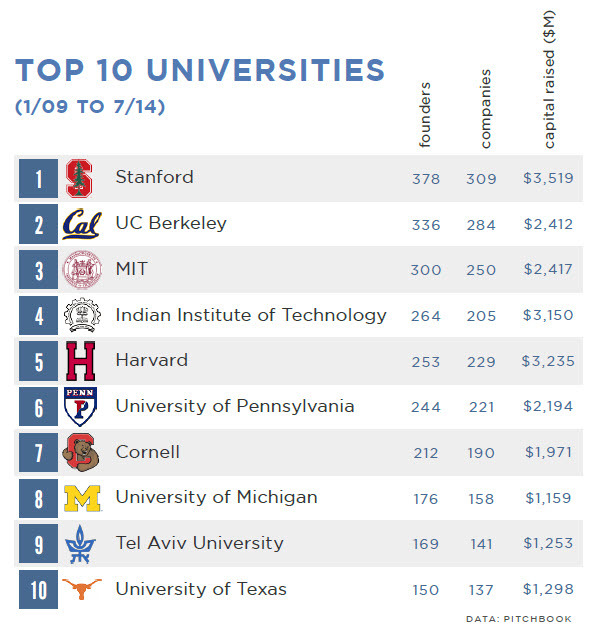 The ranking is based on the number of founders that received VC funding from 2009 through the end of July 2014, based on the founders’ undergraduate programs. The top ten includes many of the usual suspects, including nine of the top ten in our previous ranking. Topping the list again was Stanford, unsurprisingly, followed closely by another Bay Area school, the University of California, Berkeley.MIT, Harvard, the University of Pennsylvania and Cornell, four storied east coast colleges, took four of the top seven spots. Interestingly, the first non-U.S. school to make the list was the Indian Institute of Technology, which snuck in at number 10 in last year’s ranking. Including all of the school’s graduates who founded India-based companies, the school vaulted to the number 4 spot in our latest reading, ahead of Ivy League schools like Cornell (7), Yale (11), Princeton (17) and Columbia (19). The newcomer to this year’s list is Tel Aviv University at #9. Over the last several years, Israel has emerged as a technology epicenter and hub for VC investment. Two other Israeli colleges made the top 50 — Hebrew University (37) and Technion-Machon Technologi Le’ Israel (19). Rounding out the top ten were the University of Michigan (thanks to its burgeoning startup community in Ann Arbor) and the University of Texas, located in VC hub Austin, TX. Intere sted to see which other schools made the cut? Head over to our reports library, where the full rankings are free to download beginning Wednesday morning. In addition to the rest of the top 50 undergrad results, we also looked at the top 25 global MBA programs producing VC-backed entrepreneurs, and we broke down university standings in Europe and in the rest of the world, as well. Also, given all the talk recently about women and the venture capital industry, we were curious what the top undergrad and MBA programs were that are producing VC-backed female entrepreneurs. Those lists are also available in the report. Did your alma mater make it? Click here to find out.